Really, if I were in anyway organised, this blog would have been completed and posted on the 4th July. But I'm not, and it wasn't - may be being posted after the Boss's concert can make up for it? Either way, no time like the present I suppose, and I'm a big fan of the American craft beer scene. Unfortunately, I don't get to tick off another beer from “1001 Beers...” in this post but I though it was still worth sharing. All Day IPA. Style: IPA, ABV: 4.9%. Description: Poured from the bottle with little head and not much lacing. Amber/orange colour. Smells like cross between Sierra Nevada Pale Ale and Goose Island IPA, my wife thought its had grapefruit aromas. A real hop floral taste – with just a little bitterness in the after-taste. Conclusion: This was a lovely little beer. Really nice hop taste, with a bit of grapefruit in the background. Not too much bitterness, and the reasonable ABV, means this is very drinkable beer that you could have a few of and enjoy. I found it refreshing and would definitely advise anyone to give it a try. Description: A Brooklyn beer that poured with a good head. Light Blond but bread/yeast aroma from the malt and, erm, yeast. Hops not very noticeable in taste or smell. Malt and bitter taste. Conclusion: I'm a big fan of Brooklyn Brewery – especially their Black Chocolate Stout. A change from some of the other summer beers out there, this is actually more malt based and toasted grain tastes. A nice enough beer. Description: Again bready and yeasty. Bit of spice (not unlike Anchor Steam actually) Decent head. Dark amber. Good fizz that lasted. Conclusion: More like an old English pale ale. A little more malt that I expected, slight biscuit/toffee flavour. Maybe better for autumn than summer. Not bad though. Description: Lager from Flying Dog Brewery (again I'm a fan!). Light golden in colour. Fruit aromas with a slight sugar sweetness. Really fizzy, and the carbonisation lasted throughout. Not much head. Fruity/citrus taste with a little bit of grassyness . Conclusion: I've stated before that I’m not a huge lager fan. More accurately, I'm not a fan of mass produced lager with lots of adjuncts. This was really pleasant – quite fizzy and sweet, perfect for a BBQ! Going to buy a few more bottles of this, perfect for this hot weather. Conclusion: Another nice refreshing beer for a summer evening. Enjoyable. 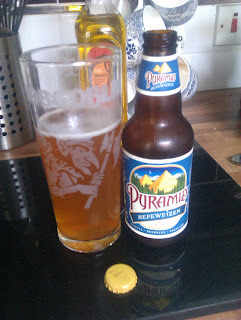 Researching the Pyramid Hefeweizen, I discovered a little bit of discussion as Pyramid (due to their ownership structure) are no longer considered a “craft brewer”. I'll be honest, for me the book, and this blog, is about finding and drinking good beer. I'm not too fussed if its real ale or not, craft beer or home brew, micro brewed or multi national produced - as long as the beer is good I’ll praise it. However, I do think the smaller guys are trying more interesting things, and I'm also keen to promote local producers. If its not good, well its one not to buy again - no matter who made it. Right, a bit of research and shopping needs to be done now if I’m to get a few beers ticked off “1001 Beers...” in my next post. Anyone bought beers online? Checking out a few websites that carry a range of beers but any tips would be gratefully received.